The Austin Junior Forum Teddy Bear Program provides Teddy Bears & Dalmatians for local public safety agencies to give to children involved in traumatic events. These stuffed animals have a calming effect, providing comfort and something tangible to hold during times of crisis. In recent years, more than 5,000 children have been involved in crisis situations, and the numbers continue to rise with the growth of our city. Austin's public safety agencies, including the Austin Police Department, Austin Fire Department, Travis County Sheriff's Office, and Austin-Travis County Emergency Medical Services, have relied on AJF to provide these stuffed animals for more than 20 years. In 1984, the City of Austin's Recreation Department hosted the first annual Teddy Bear Picnic as a means to raise funds for its summer programs. 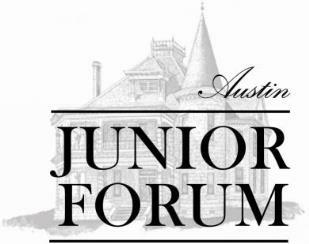 The event was well-liked by a segment of the community, so when the department was no longer able to sponsor the event due to budget cuts, Austin Junior Forum was asked to host the event. The suggestion was well received by AJF members as a means to raise funds to buy teddy bears for children who were victims of crime. Thus, the purpose of the Austin Junior Forum Teddy Bear Program was established. Austin Junior Forum hosted its first Teddy Bear event, although it was actually the 3rd Annual Teddy Bear Picnic, on the grounds of The Caswell House on September 13, 1986. The main attraction was a Teddy Bear Look-Alike Contest, and officers from the Austin Police Department were on hand to fingerprint children as part of the department’s Child Identification Program. That first event raised about $200, and with other contributions, AJF was able to donate $250 worth of teddy bears to the Austin Police Department. Each year the Teddy Bear Picnic gained momentum and grew in popularity within the community, and by 1990, AJF was able to expand the Teddy Bear Program to include donations of Teddy Bears to the Austin Police Department and Austin-Travis County EMS, and a donation of stuffed Dalmations to the Austin Fire Department. Please click here to donate directly to the Teddy Bear Program. Over the years, Teddy Bear Program events have evolved from a simple picnic to include children's carnivals, outdoor concerts, golf tournament, 5K fun runs, celebrity bear silent auctions, the Bikerz Bearz & Dogz Benefit Ride, and most recently participating in the Amplify Austin online fundraising drive to raise funds to support this valuable community service program. If you shop Randalls Grocery Stores and have a Randalls Remarkable Card, you can link your card to AJF's Teddy Bear Program. 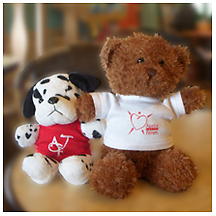 Every time you shop Randalls donates 1% percentage of your purchase amount to the Teddy Bear Program. Simply visit the customer service counter at your local Randalls store and ask for a Good Neighbor Program form or download the form from the Randalls website (Good Neighbor). On that form, indicate that you want to link your card to Charity #2061, which is the Teddy Bear Program's Good Neighbor account, and give the form back to the customer service representative.